The narrowing trade deficit of $49.4 billion vs. $53.5 billion could not incite significant movement in the index today. 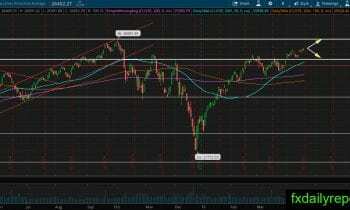 Earlier, after the opening bell, DJIA fell around 60 points before turning higher to its opening level. At the current time, the index traded down 2.37 points (-0.01%) at 26,450.29. China reported stronger GDP y/y of 6.4% vs. 6.3% expectation. Despite the news, no new update from U.S-China trade talks. The market seems taking it slow and cautious at the current time. Pepsico (NYSE: PEP) topped analysts expectation. Earnings per share come out at $1.00 vs. $0.93 expectation. Revenue comes out at $12.88 billion vs. $12.70 billion expectation. Currently, share prices up to $4.02 (+3.28%) to $126.42. Morgan Stanley (NYSE: MS) reported earnings per share of $1.39 vs. $1.17. Revenue comes out at $10.3 billion vs. $9.94 billion expectation. KMI, LVS set to report earnings after market close. Asian stock market mixed today. Nikkei up 56.31 points (+0.25%) to 22,277.97, Shanghai Composite up 9.52 points (+0.29%) to 3,263.12, Australia ASX down 21.00 points (-0.33) to 6,256.40. European stock market closed higher on China’s optimism and higher earnings. DAX Germany up 51.75 points (0.43%) to 12,153.07, FTSE UK up 7,471.32 (+0.02%) , and Euro STOXX 600 up 0.36%.